"Sampath Speaking" - the thoughts of an Insurer from Thiruvallikkeni: the all new bike-taxi : viable cheap transport or illegal one ? the all new bike-taxi : viable cheap transport or illegal one ? At first look, this lass looks like one on way to a MNC…. Life has changed in fast lane – and not many would remember the yellow Ambassador / Premier Padmini (Fiat) taxis of Chennai and the haggling – the latter part, however still continues with auto-rickshaws of the city. People unable to wait for the crowded city buses crave for a cheaper alternative ! Though not popular here, there is the ‘two-wheeler taxi’ – a scooter / motor cycle, ferrying people for fare in some countries. Recently, Cab aggregator Uber entered the bike taxi market with the launch of UberMOTO in Gurgaon. The option of choosing a bike taxi is integrated into its current app. Commuters can choose a bike taxi the same way they order cabs on the Uber app. Price of a ride starts at Rs 15 (base fare) + Rs 3/km + Re 1/minute, with Rs 20 as the minimum fare. This is the second city where Uber is offering bike taxis, following their Bangalore launch earlier this month, though they haven't launched a price war yet, as they have done with their aggressively-priced cabs. Elsewhere the newly introduced ‘bike-taxi’ ran into rough with the Karnataka government seizing 62 two-wheeler taxis belonging cab aggregator Uber for violating the Motor Vehicles Act and continuing to operate without requisite permission. "We have seized 62 Uber bikes (two-wheeler taxis, uberMOTO) today (Friday) for operating illegally. We will take stern action against them (Uber) in accordance with the Motor Vehicles Act.," Karnataka Transport Commissioner Rame Gowda was quoted as telling Indian Express. Gowda pointed out that white number plated UberMOTO two-wheelers do not comply with the rules and the drivers also lack a badge which a commercial vehicle driver should have. The transport commissioner clarified that any commercial vehicle must first make an application to the Road Transport Authority (RTA) in their respective district or area to start business operations. A senior official said the bikes had to be converted into transport vehicles, while they were being run as non-transport vehicles. There is a separate licence and permit for transport vehicles which the riders and the company had not obtained from the Transport department. In case of an accident, the rider and the passenger who hire the bike will not be able to claim insurance as the vehicle doesn’t have third-party insurance. They are riding like cab aggregators who do not work under the system and claim they are only a technology platform. They have to follow the rule of law and the regulations of the Transport department. Only then will they be permitted to operate as taxis,” another official told Deccan Herald. With that launch turning controversial, this is more about 25 year old TR Sanjana who ferries passengers on a bike. New Indian Express states that she is the first woman in the city of Bangalroe with this job-profile. Sanjana signed up for it, with Hey Bob, because of her passion for bikes. She has been riding bikes for more than 10 years. It is her part-time gig though she works between 7.30 am and 7 pm, with a three-hour break in the middle. Her route is Koramangala to Domluru. This diploma-holder in commercial practice says she could also use the money. She was inspired by her brother to start riding bikes. Sanjana started with Kinectic Honda and when she wanted to try one with gears, she went with a Moped. Sanjana has a fascination for Bullets. “I tried riding one but I am too short for it,” she says. When she heard that Hey Bob, where her brother in law works, was looking for a woman taxi driver, she jumped at the opportunity. “Not many people get to do what they love,” she says. Her parents were not comfortable with the idea initially. The idea of the company was unfamiliar to them, but Sanjana took time to help them understand it better. She took them through a typical work day. “I explained to them how supportive the company is, with comfortable work timings and a good salary, my parents came around,” she says. 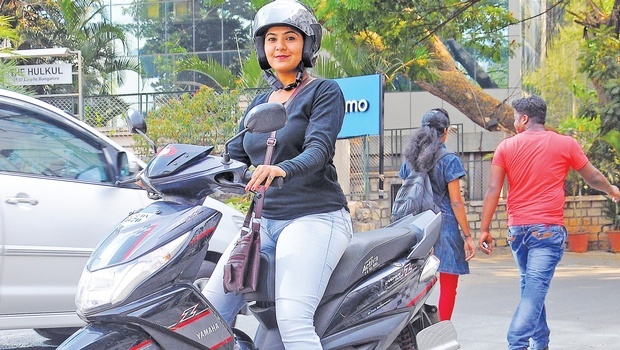 Her first ride, on her Honda Activa, was from Koramangala to The Leela Palace. “I got a good review from the pillion riders,” she says gleefully. “Women need women taxi riders to feel safe.” She has been with Hey Bob for a month and has already ferried 15 to 20 women. The city’s heavy traffic does not deter Sanjana. “I focus on the road,” she says. Now the concern for the Insurers. Any privately owned vehicle insured as such but used for ferrying passengers would be outside the purview of coverage. Sec 3 of All India Motor Tariff is for Motorised Two-wheelers. However, the applicability is to motorized two wheelers (with or without side car) used for social, domestic and pleasure purposes and for professional purposes (excluding the carriage of goods other than samples) of the insured or used by the insured's employees for such purposes but excluding use for hire or reward, racing, pace making, reliability trial, speed testing and use for any purpose in connection with the Motor Trade. There is another section to cater to the new need – it is Class C.4 of Tariff – motorized two-wheelers used for carrying passengers for hire or reward. Here the two-wheelers are required to be registered by the RTA specifically for use on such hire and/or reward. The parameters for rating are Age, Value, Cubic capacity, and zone. There is provision for covering the vehicle driven by the hirer and /or drivers with the hirer’s permission too. Further the risk of theft / conversion by the hirer of the vehicle too can be covered at an additional premium. As all related to Indian Insurance industry are aware, the Motor TP rates have been revised by IRDA and come into effect from 1st April 2016. The TP rate for motorized 2 wheeler used for carrying passengers for hire or reward is Rs.702 [for vehicle exceeding 350cc it is 1615] and Rs.473/- per passenger. An ON DEMAND BIKE TAXI SERVICE - BIKE 4 EVERYTHING hasLAUNCHED in Indore. BIKE 4 EVERYTHING is an on demand ride or deliveryservice provider which helps other businesses to flourish. BIKE 4 EVERYTHING has emerged as a one stop solution for everything that could be imagined on bike like bike taxi, bike laundry service, bike delivery service for everything etc. B4E has launched a Mobile App for booking of two-wheeler taxi for ride or any other logistics or delivery Services, which anyone can download it from Google play store in free. Bike 4 Everything provides the reliable & safe ride in minutes with a mobile based application. It is less expensive & easy to use as compared to other services.